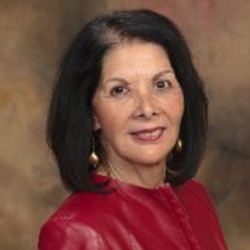 Dr. Patricia Arredondo, EdD, is Faculty Fellow to the Provost, Fielding Graduate University. She holds a doctoral degree in Counseling Psychology from Boston University and is a licensed psychologist. She is the founding president of the National Latina/o Psychological Association, past president of APA, Division 45, and American Counseling Association. Her latest book is Latinx Families in the U.S.: Transcending Acculturation, Xenophobia and Migration through Self-determination (2018).